Step right up for the Medicine Show, America's old-time entertainment that promises good health as well as a good time. Join our virtual performance as we recreate the ballyhoo, the laughs and tears, and the old-time music that made the traveling medicine show a hit for more than a century. It was family entertainment at its best: comics tickled the funny bone, ventriloquists and contortionists dazzled the mind, string-bands and buckdancers got your foot stompin. 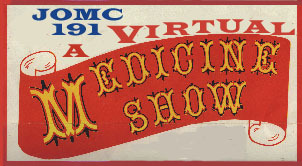 But no med show was complete without smooth-tongued practitioner selling his miracle cures. Come one and all, great and small on our cybertour of the great Medicine Show. It's just what the doctor ordered. Just follow the magic buttons on the left, and work your way on down the Med Show road starting with the program, "Today's Show."